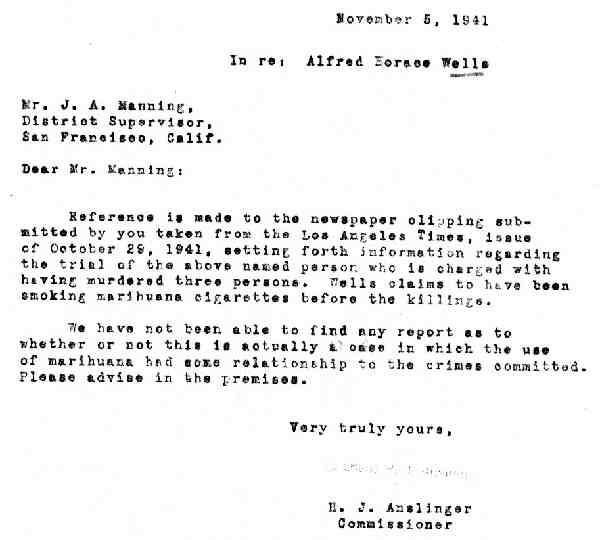 Reference is made to the newspaper clipping submitted by you taken from the Los Angeles Times, issue of October 29, 1941, setting forth information regarding the trial of the above named person who is charged with having murdered three persons. Wells claims to have been smoking marihuana cigarettes before the killings. We have not been able to find any report as to whether or not this is actually the case in which the use of marihuana had some relationship to the crimes committed. Please advise in the premises. 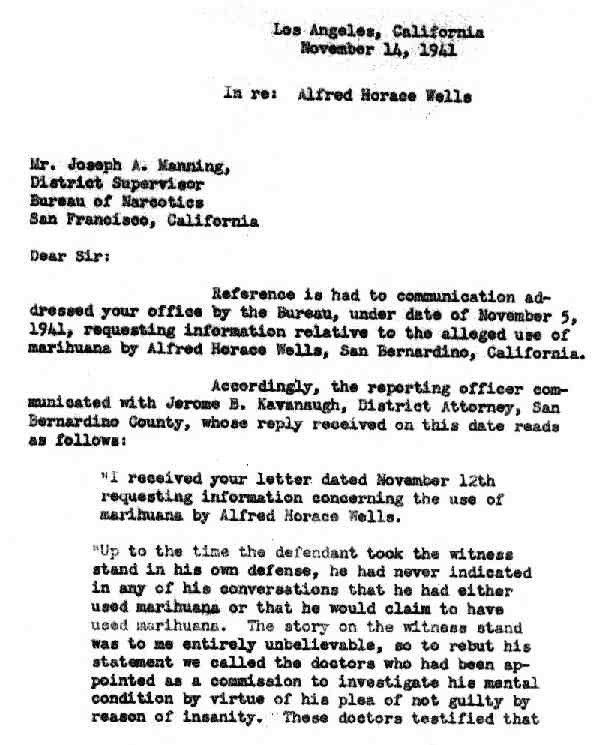 Reference is had to communication addressed your office by the Bureau, under date of November 5, 1941, requesting information relative to the alleged use of marihuana by Alfred Horace Wells, san Bernardino, California. 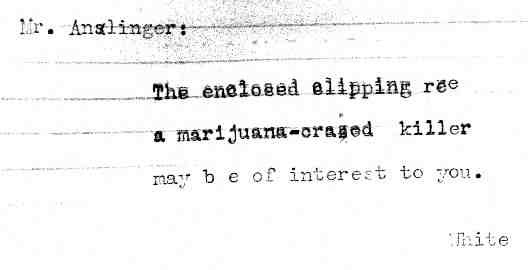 “I received your letter dated November 12th requesting information concerning the use of marihuana by Alfred Horace Wells. “Up to the time the defendant took the witness stand in his own defense, he had never indicated in any of his conversations that he had either used marihuana or that he would claim to have used marihuana. The story on the witness stand was to me entirely unbelievable, so to rebut his statement we called the doctors who had been appointed as a commission to investigate his mental condition by virtue of his plea of not guilty by reason of insanity. These doctors testified that in the course of their mental examination they had specifically asked him if he had ever used any form of narcotic and he stated definitely that he had not. 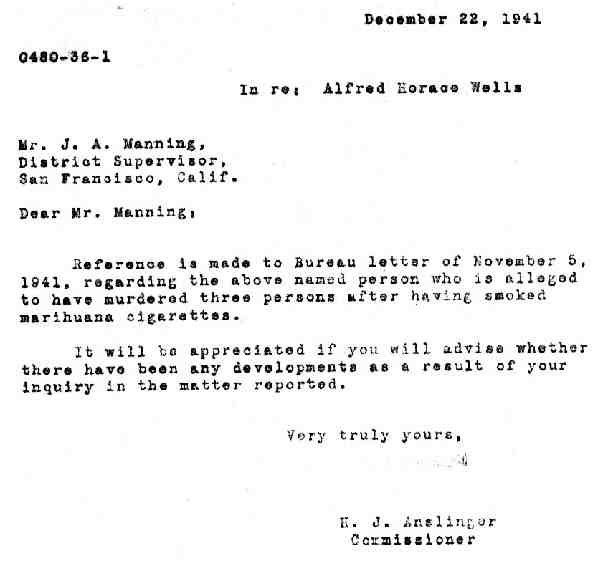 Reference is made to Bureau letter of November 5, 1941, regarding the above named person who is alleged to have murdered three persons after having smoked marihuana cigarettes. It will be appreciated if you will advise whether there have been any developments as a result of your inquiry in the matter reported. 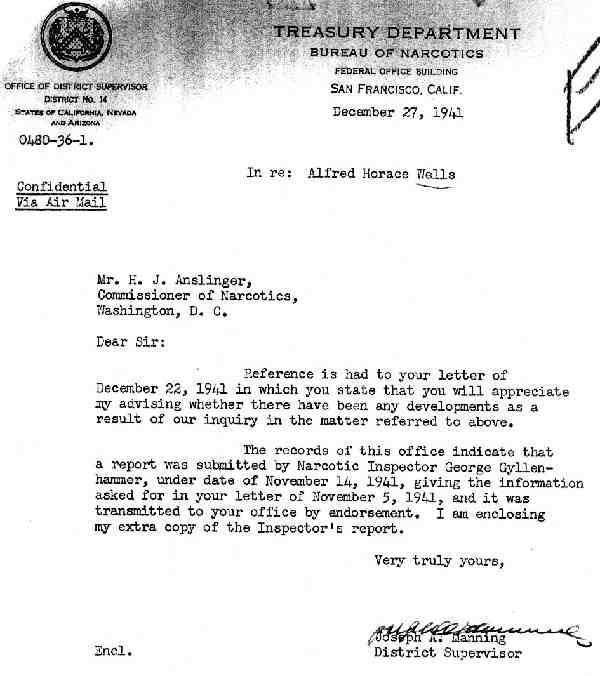 Reference is had to your letter of December 22, 1941 in which you state that you will appreciate my advising whether there have been any developments as a result of our inquiry in the matter referred to above. 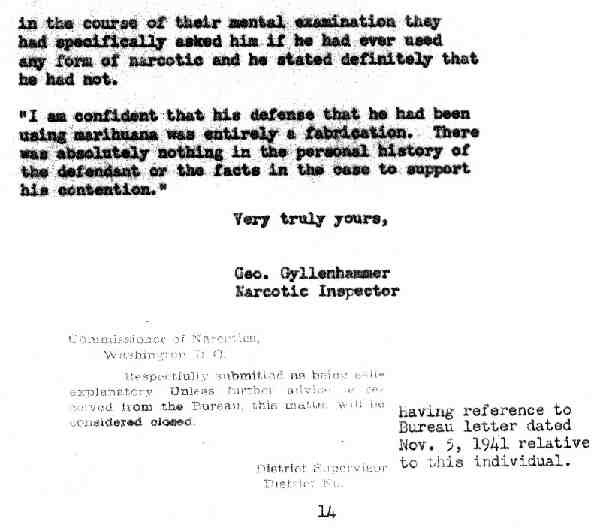 The records of this office indicate that a report was submitted by Narcotic Inspector George Gyllenhammer, under date of November 14, 1941, giving the information asked for in your letter of November 5, 1941, and it was transmitted to your office by endorsement. I am enclosing an extra copy of the Inspector’s report.